The DRFC gave a strong showing at the CRC this weekend, taking two and drawing one of their three matches in pool play on Saturday to advance to the elimination rounds on Sunday. The day started against Iona where the Big Green responded strongly in the second half to make up for a rusty first half. Dartmouth was unable to score a third time which ended the match at 12-12. The second game was against highly favored Kutztown. However, the boys came out strong and controlled the entire match and won 36-12. The final contest of the day was against Temple. While the Big Green got out to a comfortable initial lead, Temple came back in the second half but the Dartmouth reserves were able to hold off the treat. Although the Day 1 results reflected the team’s strong play and execution, it came at the cost of some key play-makers, Coleman (’19) and Bienstock (’20), who were made unavailable for Sunday’s competition due to injuries. Today, the reserves filled in seamlessly and contributed to the squad’s early lead against UCLA in the quarterfinals. Dartmouth got out to a 21-7 lead at the half thanks to strong play by Oliver Engelhart, Jack Badenhausen, and Fuller Winton. However, a few breaks let UCLA come back into the and the Bruins took the dramatic match in sudden-death overtime, having tied the score with a try in the last seconds of regulation play. It was UCLA that got the last score to advance to the semi-finals. Dartmouth did pick up some awards this weekend though. Oliver Engelhart was named to the tournament Dream Team while Fuller Winton was an honorable mention. 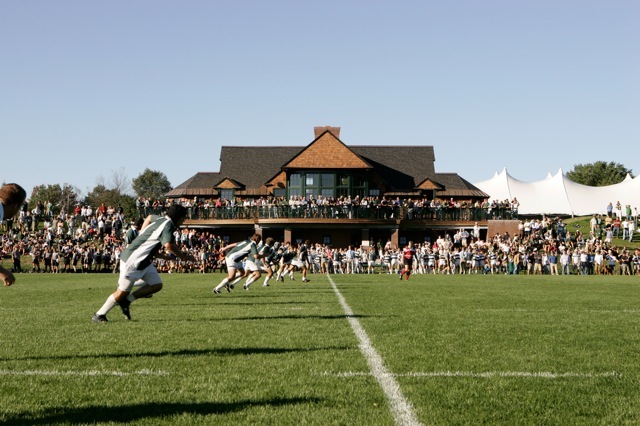 In all, the DRFC has had a successful, though very long, year of competition, taking the Ivy League title in the fall, playing a few friendly and test XV’s matches during a tour of the Bay Area in late March, and working through matches in Kansas and North Carolina to return to the West Coast for the DIAA Championship Final. It’s been an exciting but trying year for the Class of 2018, who has led the Club through an important, formative, and promising several months. The DRFC has a saying, “Leave the Club better than you found it,” which the ‘18s have certainly done. The team is in a strong place which it will surely use as a springboard moving into the 2018-2019 seasons, and they owe that, in large part, to the leadership and legacy the seniors have offered. Hats off to the ‘18s. We wish them the best of luck in their future endeavors and hope they will return to Corey Ford Clubhouse in the fall to see the fruits of what they have helped build over their tenure unfold. The Club is certainly looking forward to a big year beginning next fall.